I've been reading Marissa Meyer's work for a long time. She got her start writing fanfiction, then wrote a series of fairy tale adaptations, then followed those up with an origin story for a famous villain. I was hoping that her new book Renegades would be her first entirely original work, but, sadly, I was wrong. 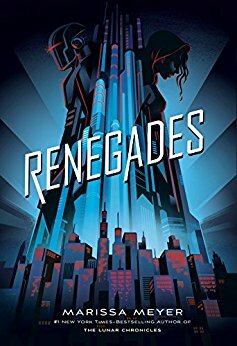 In a post-apocalyptic future, the city of Gatlon is run by a group of superheroes known as the Renegades—a group of civic-minded heroes who have spent years working to establish order out of chaos. The Renegades are beloved by nearly everyone... except for the “villains” they defeated on the way to establishing their tidy new society. Nova Artino was raised by those villains, and she has a personal grudge against the Renegades. But when her guardians send her to infiltrate the Renegade organization, she meets Adrian, the son of the group's commanders. Adrian is going through a secret-identity crisis of his own, but he and Nova are drawn to one another, despite their many other distractions. Meyer is a technically proficient writer, and Renegades sounds like a great idea: a Sailor Moon/X-Men mash-up with a cinematic setting and a star-crossed romance. Unfortunately, the story's “inspiration” frequently slips into appropriation. Nova and Adrian's angst over their secret identities directly parallels that of Sailor Moon and Tuxedo Mask. There's a minor but critical character who is strongly reminiscent of the X-Men's Rogue. Even the book's overarching themes have been explored (at length) throughout the X-Men universe. Maybe Meyer's target audience is too young to recognize her source material, but I found the derivative nature of her storytelling unpleasantly distracting. If you're constantly wondering where you've encountered a particular plot twist or character before, it's damn near impossible to lose yourself in the story in front of you.